The start of my first overland trip. In our own truck from England to Nepal, and back. Photo Galleries;- There are no direct photo galleries for this page. Most photos enlarge in a new window when clicked. The photo links frequently open a new site in a new window, Change window to return here. To do list; Proof read to do. Well here you are, in Trans Asia 1975. I don't know how you got here, whether it was methodically from the start of the site or straight into 1975. For the latter, some of the previous background information bears repeating here, just to provide context for the story. For the former, sorry for the repetition. This story is about a trip Pete Dryer and Ivan Hurst (me) made in 1975 from England to Nepal in our own truck. Pete and I had met at college and were at the time working for the same company, Percy Bilton Ltd, at the same road construction site in north London. We had one company mini van between us as we both lived in different parts of Hatfield, having not moved away since attending college there. The van was a treat, not an entitlement. On the way home that day we talked about next steps. Pete asked his fiancée what she thought about the idea. I asked my girlfriend. When Pete picked me up from my home the next morning we compared notes. Pete and his fiancée were up for the trip whilst my girlfriend would stay at home. So the crew was set at three. Over the next few weeks we asked around friends and got offers of help and a couple of additional people interested in the trip. We also discussed the route and what sort of vehicle we should take. One of the new team had recently passed his navigation exams. So our most ambitious route involved a boat. We would drive to New Delhi and then to South West India where they are famous for the quality of the boats they build. Not luxurious western style but thoroughly seaworthy, and considerably cheaper than a UK built boat. We were going to take a marine diesel engine in the back of the truck to put in the boat as that is the difficult part to acquire in India. The trip would then recommence as a sea voyage hugging the coast all the way to China. After that the plans were somewhat vague. That plan started to fall apart when we realised that we would be at sea during the cyclone season. It was totally canned when our navigator dropped out of the trip. We re-planned the trip again, still New Delhi and then across the north of India, Bangladesh, Burma, Thailand, Laos and China. So back to the concept of the Grand Trunk Road, which is still acknowledged as a major highway of the world. Another trip to the library required. Oh dear, Burma is closed. OK, the destination is Nepal. And that is where we went for my first ever trip abroad apart from a trip to Ireland with my parents when I was a kid. Back to the choice of vehicle. We did not know the condition of the roads we were going to encounter. We wanted something tough, easy to maintain and easy to get spares for wherever we where. We considered the ubiquitous Land Rover but decided it would be too small. We found a old Bedford TK truck previously owned by Kraft. It was a box truck used for chilled foods and was insulated. Only thinly, not as thick as a frozen food truck and instead of a heavy door it had a roller shutter. The insulation would be beneficial in the hot countries. It weighed less than 7.5 tons so we did not need a HGV license to be able to drive it. The equivalent 4x4 Bedford MJ has a GVW about two tons more, and that is for a soft top. We wanted a hard box for reasons of security. We bought that truck for about £300 after a friend, a truck mechanic, had looked it over. He also prepared it for the journey, repairing the worn out bits and a giving it good service. We found some very old front windows in a truck scrap yard and fitted them to the front of the box above the cab. Add some side windows and an elevated platform with two pairs of coach seats and we have room for a crew of seven. Its amazing how versatile some surplus 4x2 timber and external ply can be in skilled hands. We also built a storage box along the side of the box for our food and stuff. It also served as a single bed. Otherwise, the floor was the bed. We did not go for luxury. We slowly found out about international driving licenses, visas, and inoculations, and got them sorted. We started taking malaria tablets and Vitamin B12. Apparently the latter makes you smell unattractive to mosquitos. We decided against salt tablets as this could be sorted out on the road. We gave up sugar in tea and coffee so that we did not miss it on the trip. Just in time we found out about Carnet de Passages en Douane and obtained one from the RAC. The place on the ferry was booked. In the meantime the crew had dwindled back down to three. We had all resigned from our jobs, packed up our rented homes, and were generally ready. We did the shopping and filled the truck and parked it up ready for the morning. I arrived at Woolworth’s car park in the centre of Hatfield ready for our early departure and waited for Pete and Chris to arrive whilst warming up the engine. I think it may have been raining lightly. Eventually Pete turned up, but without Chris. That morning she had decided than she was not coming. She would stay in the UK and wait for him to return. Pete and I discussed this and then, all things sorted out, we departed for our Grand Tour, our first grand adventure. One mistake, and regret with this first trip was, that along with giving up sugar for the journey (totally unnecessary) we decided not to take a camera. This was due to a combination of not wanting to risk having the camera stole and the difficulty of carrying and storing so much film. Digital cameras were not to arrive for many decades. Photos sorely missed. 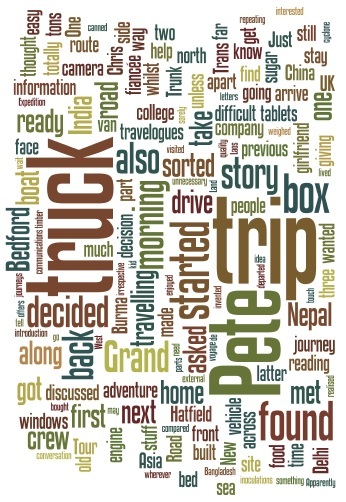 Hover over the word cloud below and click to jump to either the background reading, or to a particular chapter of the story. Map of Hatfield below showing where Pete and I were students, where we lived and the start of our trip.